Ask any fan of horror fiction or scary movies, and they’ll tell you that New England is the land of phantoms. From Salem’s witches to H.P. Lovecraft’s Providence, the far north of America’s East Coast is home to some of the world’s most terrifying myths and legends. All six states contain a multitude of folktales, campfire stories, and hauntings. On October 9, 1890, The Vermont Standard ran a sensational headline: “Vampirism in Woodstock.” The article detailed an event that had transpired some 60 years earlier in 1830. That year, a local man named Corwin died of consumption (tuberculosis). He was buried in Woodstock’s Cushing Cemetery—a common resting place for the departed residents of this sleepy Vermont village. Six months after the burial, Corwin’s brother also became ill with tuberculosis. After failing to find either a cause or a cure, many prominent men in the village, including Dr. Joseph Gallup and Dr. John Powers from the Vermont Medical College, began blaming vampirism. As a result, the body of the deceased Corwin was exhumed for an autopsy. This postmortem analysis supposedly revealed that Corwin’s heart had not decayed but instead was full of blood. 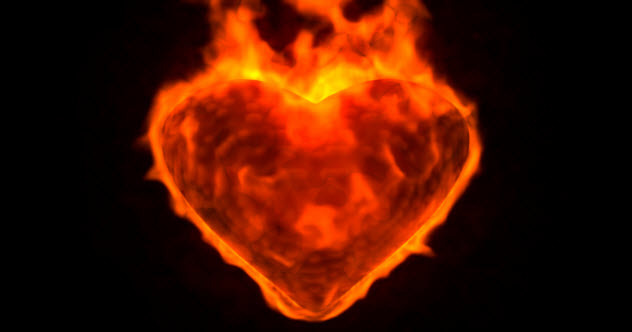 Following the New England custom, Corwin’s heart was removed and publicly burned on the town green. Amazingly, this was not the first time that a vampire panic had touched Woodstock. In 1817, a Dartmouth student named Daniel Ransom became sick with tuberculosis. Shortly after Ransom died on February 14, his father grew concerned that his son had become a vampire. So the father had his son’s body exhumed and the heart removed and burned to protect the health of the remaining members of the Ransom family. During the 19th century, this practice was repeated throughout New England. The most famous case occurred in Exeter, Rhode Island, in 1892 with the death of a young girl named Mercy Brown. Other instances forced artists such as Henry David Thoreau to comment on the strange superstition. Coos County—the largest, northernmost county in New Hampshire—is predominately rural, frequently cold, and almost entirely remote. It’s the perfect place for a Sasquatch to roam. Known as “wood devils,” these tall, skinny, gray-haired animals have reportedly been sighted throughout the county. While Bigfoot sightings in New Hampshire are not confined to Coos County alone, the fast-moving wood devils have been seen since at least the 19th century. Preferring the deeply wooded areas along the borders with Canada and Vermont, a majority of wood devil sightings occurred in the 1970s when hikers, town residents, and amateur explorers believed they saw Bigfoot-like footprints and the creatures themselves. The Appalachian Trail cuts through the White Mountains of Coos County, giving the region the culture and spirit of Appalachia. While some have linked wood devils with other creatures from Appalachian folklore, New Hampshire isn’t the hotbed of Bigfoot activity that the Pacific Northwest and upstate New York are. Still, the wood devil myth remains an intriguing addition to the overall lore. 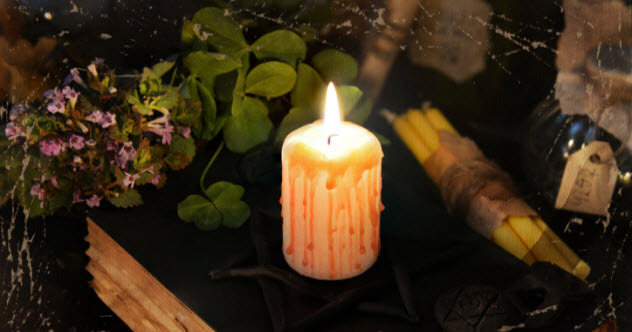 Long after the Salem witchcraft craze, Bristol, Connecticut, experienced witchcraft hysteria between 1800 and 1810. In one instance, a young woman named Merilla Norton claimed that her aunt had “bewitched” her during the night, bridling her like a horse and riding upon her back all the way to Albany, New York. There, Norton was supposedly forced to witness a meeting of witches that involved satanic rites. After making her confession, Norton became the subject of an exorcism. The testimonies of Norton and others helped to inspire a series of witchcraft trials in Bristol, which were some of the last in New England history. Another story from Bristol concerns Elijah Gaylord, who was so terribly harassed by a witch that he was forced to leave the town altogether. 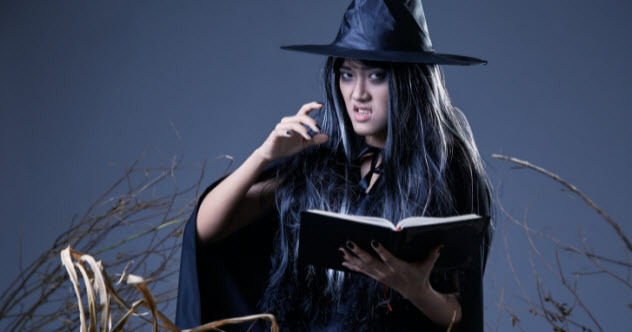 Ultimately, Bristol’s witch trials were nowhere near as bloody as previous New England panics, but they helped to form a circular history that begins with 17th-century Connecticut and ends with 19th-century Connecticut. Although Rhode Island is the smallest state in the US, its bizarre history is large with legends of vampires, ghost ships, and mysterious ocean lights. The weirdest of all may be the ruins of Hanton City, a “lost city” not far from Smithfield. Originally a small farming community, Hanton City was isolated from its neighbors, which left room for all sorts of suggestive rumors. Some said that Hanton City was populated by freed or runaway slaves, while others believed that the village was a sort of leper colony populated by disease-stricken people forced to live deep in the woods. Rumors aside, all that is left of Hanton City is a series of stone foundations, some unattached walls, a burial site, and other collapsed edifices. A set of headstones, all of which bear the last name Smith, can also be found in the ghost town. Sadly, not much else is known about this colonial-era settlement except for a few whispered stories about inexplicable noises and a generally spooky atmosphere. Known as the “Green Mountain State,” Vermont could also be called the “Ancient Stone State” because about 200 stone chambers, or “dolmens,” dot the central and southern portions of the state. In the town of Royalton, there are six such structures in a small area. Another major site is located in South Woodstock, where cairns, standing stones, and stone chambers can be found in a naturally made bowl between two ridges. The odd nature of these structures has caused archaeological controversy for decades. 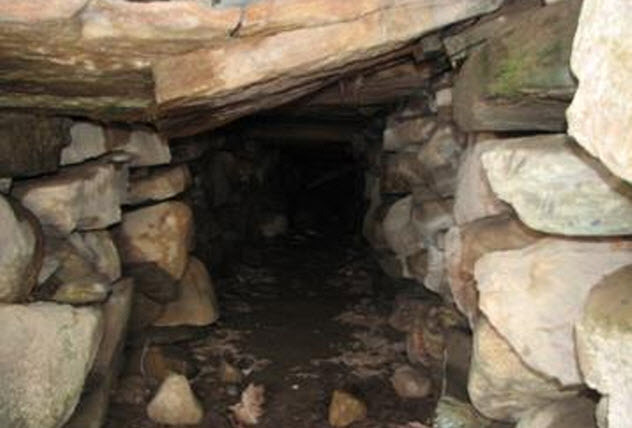 Some have claimed that they represent solar calendars used by Native Americans, while a small, vocal minority has proposed that the stone chambers are artifacts from a pre-Columbian, Celtic civilization that existed in ancient New England. The supporters of this latter theory claim that the stones are covered in a form of ogham script, which is an Irish alphabet that was used in the early medieval period. Under this theory, the Celtic inhabitants of Vermont traded with Phoenician sailors who frequently visited the shores of North America. Although it’s doubtful that ancient or medieval Irish settlers built these structures, the stones remain mysterious. According to some sources, carbon dating has shown that the stone structures may be 2,000 years old. 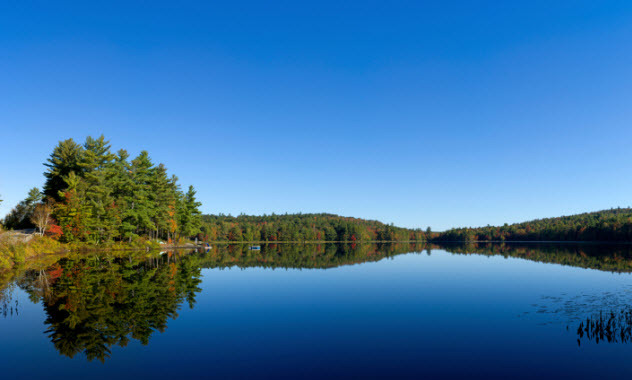 Despite its funny name, Pocomoonshine Lake is a beautiful lake in the northeastern Maine town of Princeton. A historic vacation destination, Pocomoonshine Lake became notorious in the 1880s when witnesses claimed that a large creature lived in the lake. In 1882, sawmill owner Sewell Quimby claimed to have seen evidence of a snake in the river that was 9–18 meters (30–60 ft) long. While this might have been laughable to some, the idea that a giant snake lived in Pocomoonshine Lake had a connection with Native American folklore. In particular, one story claimed that a fight between an Algonquin shaman and a Micmac chieftain turned into a supernatural battle when the pair transformed into a giant snake and a monstrous serpent, respectively. After the Algonquin shaman won, the Micmac chieftain was killed and tied to a tree near the lake. Today, that monster is affectionately known as “Poco.” Unlike other lake monsters, Poco is not just seen in the water. According to legend, Poco frequently leaves huge snake trails on the land when he journeys into the woods surrounding the lake. In the tiny town of Danville, New Hampshire, a frightening creature known as the “devil monkey” was known for howling loudly during the night. A large primate with long claws, a reddish-brown coat, and a doglike snout with razor-sharp teeth, the creature occasionally entered the town. In September 2001, Danville’s fire chief claimed that he saw an unknown creature running through Danville’s streets late one night. After this sighting, the devil monkey was seen nine other times over a two-week period, causing a small panic throughout Rockingham County. After search parties failed to locate the beast by late September, eyewitness reports dried up and the devil monkey no longer haunted the residents of Danville. Most believe that a feral but non-demonic monkey was behind the devil monkey hysteria, although more superstitious voices claim that the creature moved to the secluded northern mountains of New Hampshire. 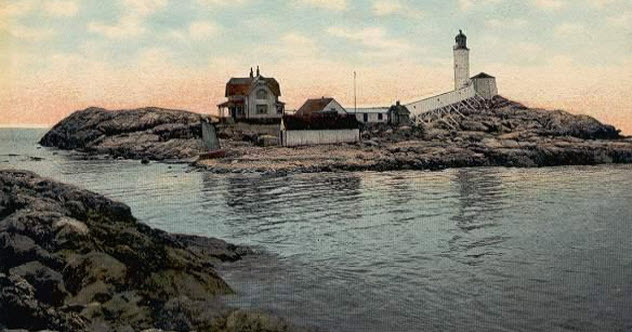 As the story goes, Harry Main came to the Massachusetts seaport town of Ipswich from the Isles of Shoals—a series of islands not far from Portsmouth, New Hampshire—where an unsolved double murder from the 19th century continues to intrigue those interested in the dark underbelly of New England’s history. Before coming to Ipswich in 1671 with his friend Andrew Diamond, Main had been a successful fisherman. When both men moved to Ipswich to continue their fishing activities, Diamond’s career took off. He helped to build several wharfs in the town and co-owned a fleet of merchant ships that actively took part in New England’s profitable trade economy with Great Britain. While Diamond became a wealthy and well-respected man, Main turned to a life of crime. In particular, he worked as a “wrecker” who would steal whatever he could from the many ships that wrecked near Ipswich’s shores. Worse still, Main was a “mooncusser,” a type of pirate who purposely set bonfires on Ipswich’s beaches to steer ships toward dangerous rocks. Like the fictional General Zaroff of The Most Dangerous Game and the founders of Antonio Bay in John Carpenter’s The Fog, Main not only caused shipwrecks, he also killed off the survivors. When Main’s crimes came to light, legends say that he was tied to a stake in a sandbar and forced to perform the Sisyphean task of shoveling sand until his demise. Since then, Main’s ghost has been said to haunt his former residence on Water Street, where a secret treasure protected by magic may contain all the items that he stole from those wrecked ships. 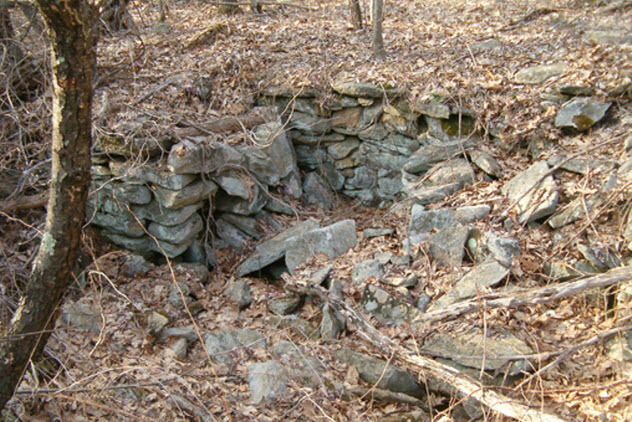 Approximately 6 kilometers (4 mi) from the western Massachusetts town of Pittsfield, Wizard’s Glen is a haunted spot in the Berkshires where Native American shamans reportedly carried out human sacrifices on the “Devil’s Altar.” A rocky hollow that produces natural echoes, Wizard’s Glen is also said to be haunted by the spirit of the daughter of Miahcomo, a once great and powerful chief. Many of the rumors and tall tales surrounding Wizard’s Glen stem from the old Puritan fear of the wilderness and a misunderstanding of Hobomocko, a Native American entity known for making a racket. For Massachusetts’s colonists and settlers, Hobomocko took on the visage of Satan, making Wizard’s Glen an evil place full of black magic and blood rituals. In the most famous story, a hunter named John Chamberlain had to seek refuge in Wizard’s Glen because of a rainstorm. While Chamberlain struggled to sleep during the night, he was suddenly struck with a delirious vision of demons and Native American warlocks gathering in the forest. At some point, the Devil appeared in order to accept the sacrifice of a Native American girl. Using his Bible, Chamberlain scared off the demons and saved the girl’s life. Despite Chamberlain’s heroics, legend claims that the glen is still cursed today. Along with Vermont and Rhode Island, 19th-century Connecticut had its fair share of vampires. In the 1840s and 1850s, the Ray Family of Jewett City suffered many tragedies from consumption. The first to die was 24-year-old Lemuel B. Ray, the son of Henry and Lucy Ray, in 1845. Then in 1849, Henry also died of tuberculosis. He was followed to the grave two years later by 26-year-old Elisha. By 1854, the remaining members of the family, including the very sick Henry Nelson, began to suspect that vampires were responsible for the family’s numerous tragedies. On the night of May 8, 1854, the surviving Ray siblings and their mother, Lucy, dug up the bodies of their dead relatives, decapitated some of them, and even burned the internal organs of one corpse. With the burned ashes, the Rays made a liquid concoction that was passed between them as a way to fight the disease. In accordance with New England tradition, Elisha, who had been the last to die, had his heart removed. When the Rays found evidence of fresh blood in Elisha’s heart, they concluded that he was the chief vampire responsible for the disease. They burned his body and his coffin to expel his evil spirit. Like other vampire panics in New England, the case of the Ray family was covered widely by local and some outside media. Interestingly, Jewett City is a borough of Griswold, Connecticut, where a coffin marked “JB-55” was found to contain the exhumed bones of a man who had been a suspected vampire in the 1790s. Like some of the Jewett City corpses, who had their decapitated heads placed at their feet following exhumation, JB-55 had his two femur bones arranged in an “X” pattern beneath his decapitated head five years after his death. Both of these cases display the intricacies of New England vampire folklore as well as the widespread assumption that tuberculosis and other diseases were caused by the unclean spirits of the dead. Benjamin Welton is a freelance writer based in Boston. His work has appeared in The Atlantic, The Weekly Standard, Listverse, Metal Injection, and others. He currently blogs at literarytrebuchet.blogspot.com.